Browse: Home / News / Instant Customs – Show us your hybrids! 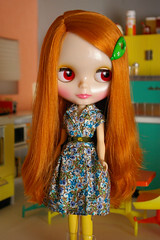 While looking around Flickr for pics of Miss Sally Rice, I couldn’t help but notice the number of people “Hybridizing” their Blythes. Since RBL Blythes give us the opportunity to swap scalps with no cutting, sawing, or stress, we’re seeing more people play “musical scalps” with their Blythes!Â I had lots of fun trading my Miss Sally Rice’s scalp with my other RBL girls, and couldn’t resist swapping a few others just for fun.Â Ebony and Darling Diva got the swap, and I love DD with dark hair so much that I might have to keep my eye out for a spare Ebony scalp! Show/Tell us about your creative RBL hybrids in the comments! hey melissa! what’s that first scalp you had with your sally rice? it looks amazing! it’s one of the factory 1-offs, I think. she was sent here for Team Sibley and I couldn’t bring myself to pull that red hair out, so I traded for one of my own scalps. looks like eleanor with a side part to me. are you participating in the “fashion” show exhibit next year? i love to swap scalps, i think sally rice looks great in everything….my collection is most sally rice dolls with other scalp/domes on her now…….love all the tips……. 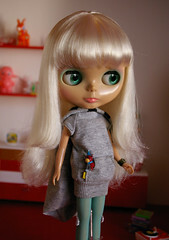 could you put up a pattern for that dress with the wide skirt and the pom poms? It’s really cute! 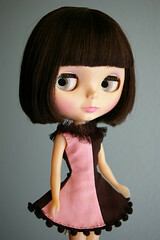 I would like to add a doll to this but dont know how to upload the pic from flickr.